Here’s a concept that isn’t new: a company should create value for potential clients before asking for anything (i.e. a sale) in return. I can say with 100% certainty: I want User10 to provide value up-front before a sale. But, I’ve struggled with the concept. Why? It’s never been clear to me exactly how we should be delivering that value to our clients. There are a ton of options on how to go about doing it —start a podcast, stream live video with tips and tricks, write tutorials… the list goes on. Each one accompanied by a slew of really successful advocates swearing up and down that you HAVE to be doing exactly what they are or else you’ll be left behind in the dust. Trying to think through the myriad of strategies left me feeling like I just wasn’t getting it. Honestly, I don’t want to start a podcast, and I’m not that interested in recording videos every week either. It turns out that I actually wasn’t getting it, but it was for a reason I didn’t expect. Back when we started User10 we weren’t making much money and — probably as a result — we were the sort of agency that felt compelled to bill for any of the time we spent with clients. Sure, we’d do short discovery phone calls to get the gist of what a client’s project was, but once we passed that point we wanted to roll right into paid consulting sessions. The approach was a hard sell. We didn’t really like doing it either. The limited time we had with clients before project kick-offs didn’t allow us the ability to build the level of trust that big brands wanted before giving their sign-off on a project. As we’ve grown and refined our strategy, our client’s have grown accordingly. They’re bringing more value to us so we need to do the same in return. We’ve found ourselves in a position where we’re actually excited about continually giving more up front — it allows us to build better relationships with our clients and it leads to clients who are more engaged and excited about the work we’re collaborating on. All that makes a huge difference over the life of an application or website build. This is huge for us — it’s the single best way we’ve found to continually create value for our clients. Building software isn’t easy and in a world full of templated RFP guess-work, taking the time to actually understand our client’s needs has separated us from the pack. This typically means we: spend time researching possible technical solutions, whiteboard or design comps to better illustrate how we’d solve a problem, or get outside the box and respectfully challenge their core assumptions. We’re frequently able to identify risks that people haven’t been able to see on their own. 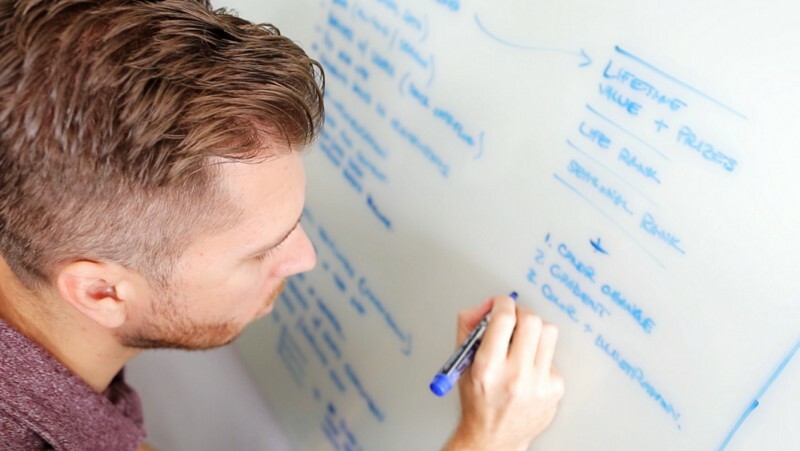 Whiteboarding: It’s not just every marketing agency’s homepage background image. It’s actually useful! 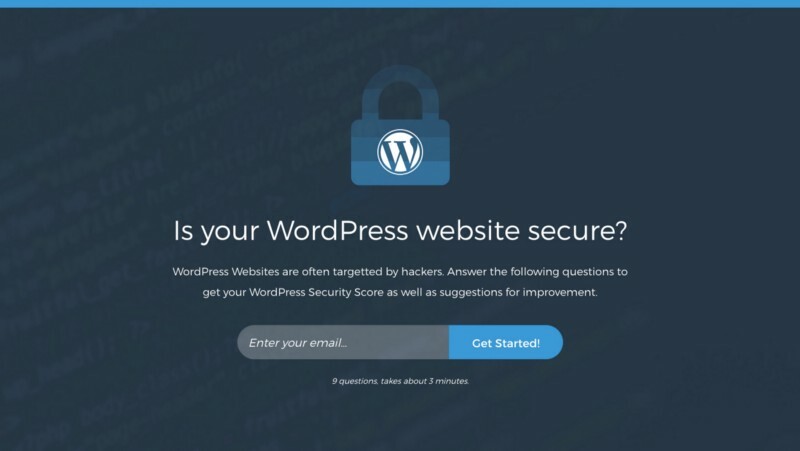 We’re starting with WP Security Score to give WordPress site owners an idea of how safe their website is. It scores their current setup and gives them feedback and solutions in the areas they’re struggling with. We also have a code review on the horizon which will help companies determine the general integrity of the software they currently have. Our goal is to add another valuable point of analysis when making those tough decisions to re-build or upgrade platforms. WP Security Score can quickly give potential clients insights into how safe their WordPress website is. Saying “No” sounds like a bad sales strategy. It’s not. I promise. There’s no value in selling a website re-design to someone that really just needs to drive traffic to their existing site through a Google AdWords campaign. Want to know what is valuable? Telling them we aren’t the right fit AND introducing them to one of our trusted partners — that we’ve worked with and vetted — who is the right fit. By actively building relationships with other agencies that compliment our niche, we’re able to point potential clients in the right direction and ensure they get the actual help they need. It’s taken some exploration, but I think we’ve finally arrived at a set of value-adds that are right for our team. These are things we actually want to do and they don’t ever feel forced. We’ve received fantastic feedback on our approach too. Client’s get a chance to interact with our brand, which — in User10’s case — is really our people. Our clients choose us because they’re confident in our abilities as a team to execute on their ideas. It’s critical that they have an opportunity to collaborate with us one-on-one before they pay to collaborate with us. It’s been interesting to reflect on this whole concept. As a team, User10 has been adding this type of value for a while now. But, it’s only recently that I was able to acknowledged that fact. I was too hyper-focused on what everyone else was doing and what our team wasn’t, rather than what we are doing that other people aren’t. User10’s path isn’t a podcast or live streaming — those things aren’t really us. Spending time one-on-one with clients to really understand their problems? That definitely is.